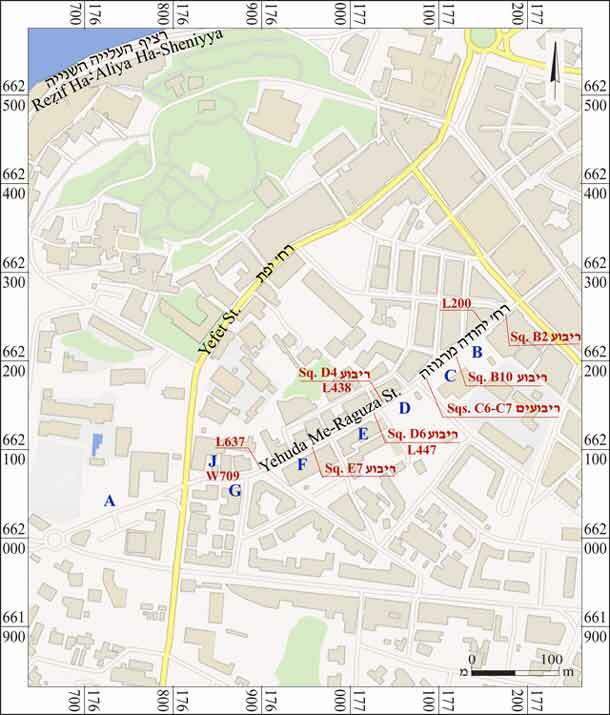 In October–November 2011, May–August 2012, November–December 2012 and March–April 2013, salvage excavations were conducted on Rabbi Yehuda Me-Raguza Street in Yafo, along the eastern edge of the Flea Market compound (Permit Nos. A-6233, A-6482; map ref. 176655–7191/661990–2267; Fig. 1), prior to the renewal of the infrastructure. The excavations, on behalf of the Israel Antiquities Authority, were directed by Y. Arbel and L. Rauchberger, with the assistance of V. Shustin, Y. Marmelstein, H. Vanda and T. Greenwald (area supervision), Y. Amrani and E. Bachar (administration), R. Mishayev, M. Kunin, A. Hajian and M. Kahan (surveying and drafting), A. Peretz (field photography), C. Amit (studio photography), C. Ben-Ari and A. Dagot (GPS), M. Shuiskaya (pottery drawing), J. Bukengolts (pottery restoration), L. Kupershmidt (metallurgical laboratory), A. de Vincenz, P. Gendelman, E.J. Stern, K. Burke and G. Finkielsztejn (ceramics), R. Kool (numismatics), K. Raphael (metal artifacts), M. Sadeh and I. Ktalav (archaeozoology), O. Ackerman (geological consultation), M. Ajami, D. Barkan and students from Tel Aviv University. We are in debt to Y. Misch for bringing to our attention the inscribed rails near Area D.
The excavation is one of numerous salvage excavations that were conducted in the past two decades prior to the urban renewal of Yafo. Extensive excavations were carried out on the streets of the flea market near Rabbi Yehuda Me-Raguza Street (Peilstöker et al. 2006; Arbel 2008) and Yehuda Ha-Yammit Street (Haddad 2011; Arbel 2012; Haddad 2013), as well as in the Andromeda Hill compound (Avner-Levy 1998; Ayash and Bushnino 1999). 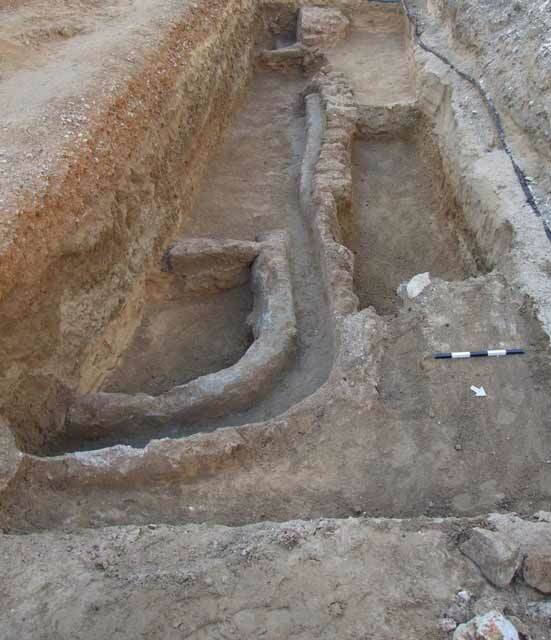 These excavations yielded burial compounds and agricultural and industrial installations ranging in date from the Late Bronze Age to the Ottoman period. Evidence of urban expansion was indicated in several of the periods. Only small excavations were conducted in the street itself. In its southwestern part, near Yehuda Ha-Yammit Street, tombs dating to the Hellenistic and Roman periods were exposed (Ginzburg 2000); these were part of the large necropolis, the center of which was on Andromeda Hill. Six tombs from the Byzantine period were discovered in the middle section of the street (Peilstöker 2000; Peilstöker 2006). The current excavations were conducted along the entire length of Rabbi Yehuda Me-Raguza Street, apart from its northeastern end (between Ole Zion Street and Bet Eshel Street), which had been excavated in the past (Peilstöker et al. 2006). The excavations were limited to a strip (max. width 2 m, depth below street level 1.5–3.0 m) on one side of the street, primarily along its eastern part. In most of the squares no architectural remains or installations were uncovered; however, pottery sherds from the Hellenistic, Roman, Byzantine, Islamic, Crusader and Ottoman periods were found. Tombs dating to the Middle Bronze Age II, Hellenistic, Roman, Byzantine and Ottoman periods were exposed in several squares, as well as architectural remains from the Hellenistic, Byzantine and Ottoman periods and irrigation and drainage channels and streets from the Late Ottoman period and the British Mandate. Middle Bronze Age II. A jar and a jug dating to the Middle Bronze Age II (Fig. 2) were found in a layer of sand above the natural kurkar in Sq D6 (L447; 3.2 m below street level). The upper part of the jar was missing. The juglet was complete, apart from the tip of its neck, and it had been placed inside the jar. These are the only finds from this period discovered outside the precincts of the mound. Comparisons with similar finds indicate that the vessels were used in infant burials. The bones were not preserved, probably due to their brittleness and to the type of soil in which they were buried. Hellenistic Period. Strata dating to the Hellenistic period were discovered east of Tel Yafo at several sites in the vicinity of the flea market (Peilstöker et al. 2006; Arbel 2008; Peilstöker and Burke 2011; Barkan and Buchennino 2012); however, the finds were insufficient for ascertaining the extent of the city during that period. Pottery sherds from the Hellenistic period were found in most of the squares that were excavated to a depth of more than 2 m, although unequivocal layers from this period were identified in two locations only. The first is a cluster of debris and ash (L438) that included fragments of locally produced and imported storage vessels and table ware (Fig. 3), without any architectural context, found at a depth of c. 2.1 m in Sq D4. 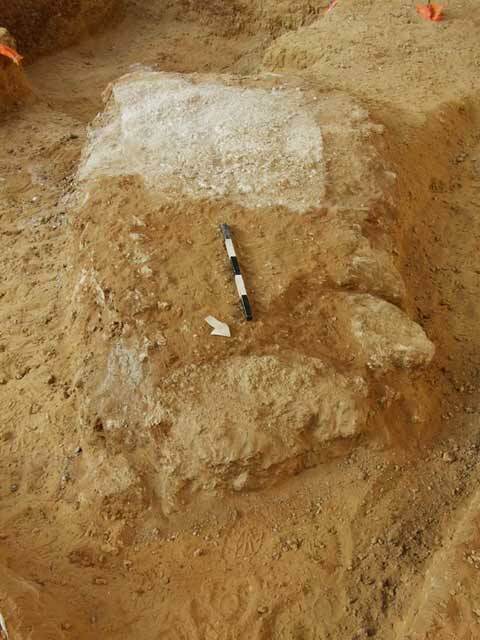 The second is a single course of a wall foundation built of kurkar fieldstones and the bedding of an adjoining earthen and plaster floor revealed in Sq E7 (Fig. 4). A pit grave that was sealed with soil containing Hellenistic and Roman sherds was identified c. 10 m south of the wall. Four pit graves were found in Area A (Fig. 5). The bones in two of the graves (L119, L124) were of adults and were preserved in an articulated position (Fig. 6). The two other graves were damaged, and the bones found in them were scattered and poorly preserved. The graves resemble many of the graves from the Hellenistic period that were found on Andromeda Hill and on Yehuda Ha-Yammit Street. A complete Rhodian jar, stamped jar handles, an intact unguentarium and other pottery sherds from the Hellenistic period were discovered near the graves. A rock-hewn cave (L127) located southwest of the graves was likely used for burial as well. Its opening was damaged probably close to the time it was used. Three upright stone slabs positioned next to each other blocked the entrance (Fig. 7). It was not possible to excavate the cave. A collapsed cavity, blocked with soil and chunks of rock, was exposed at the southwestern end of the area (L128, L129). This was possibly another cave in secondary use, or a cave that was destroyed during the Islamic or Crusader periods, judging by the sherds collected from the rubble. Roman Period. Four cist graves (L112–L114, L116) lined and covered with beach rocks were exposed in Area A (Fig. 8). 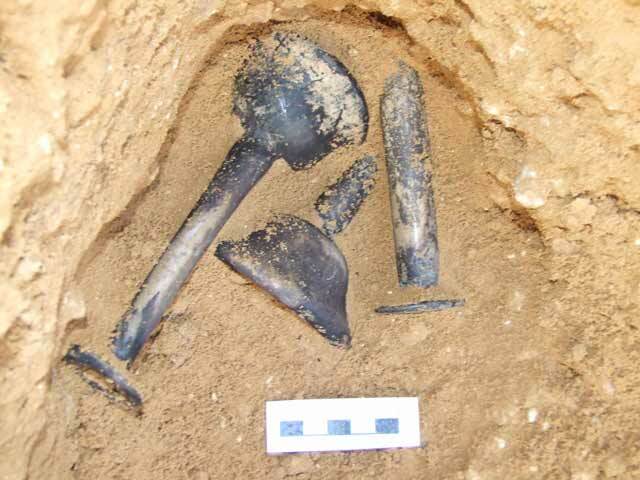 A partial excavation could only be conducted in one of the graves (L112), where four candlestick-shaped glass bottles from the second or third century CE were found, three of them intact (Fig. 9). Various types of Roman tombs were discovered east (Arbel 2008; Peilstöker and Burke 2011:180) and northeast of the mound (Jakoel 2012) of the tell. Potsherds from several phases of the Roman period were found in soil accumulations at several points along the street, but no building remains were discovered. The finds, including those from the areas on the slopes of Tel Yafo, indicate that the built-up urban area did not extend beyond the boundaries of the tell, unlike in earlier and later periods. Byzantine Period. 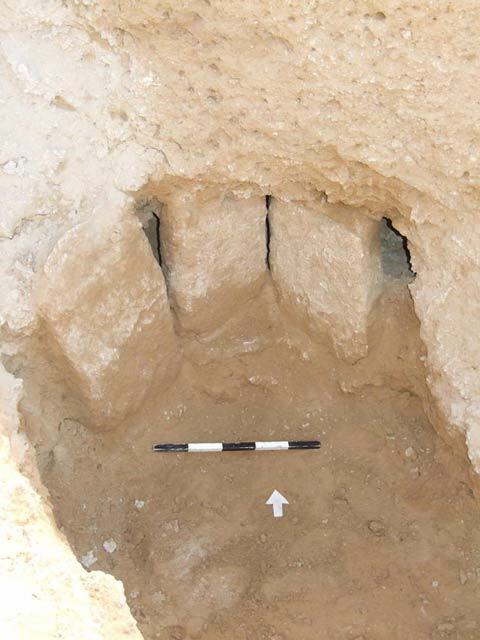 Remains of a building and evidence of kiln activity dating to the Byzantine period were found in Sqs C6 and C7. The structure remains comprise three kurkar-built walls. They were preserved to a maximum height of two courses and probably served as foundations (Fig. 10). The walls were constructed without mortar and were plastered. They connected to form straight-angle corners, and they seem to have delineated at least four rooms or spaces. 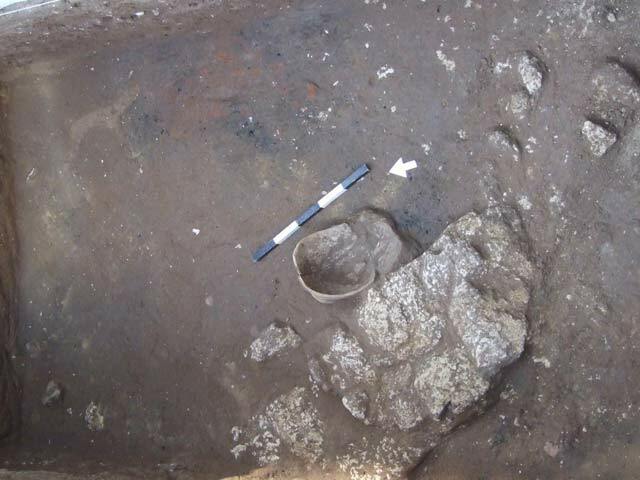 About 5 m north of the building was a concentration of kiln waste: a thin layer of lime (Fig. 11), above it a layer of hamra mixed with sand and burnt stones on top of the heap. Another pile of stones was found south of the layer of lime. The finds from these layers included industrial slag and pottery sherds dating to the Byzantine period. A section of a wall exposed in Area Bw was partly built of large, roughly hewn kurkar stones, the likes of which were not found among the building remains along the street. The wall was dated to the Byzantine or Early Islamic period based on the pottery in the layer that abutted it; however, because of the narrow exposure, the functional context of the wall remains uncertain. In the southern part of Sq Bw were two adjacent cist graves covered with kurkar or sandstone slabs (Fig. 12). The western tomb was hewn in the natural kurkar bedrock and lined with stone slabs. The bones in the graves could not be examined, and the pottery sherds found in them are not earlier than the fifth century CE; the eastern tomb was not excavated. As mentioned above, other tombs from the Byzantine period were exposed in previous excavations along the street (Peilstöcker 2000; Peilstöker 2006). 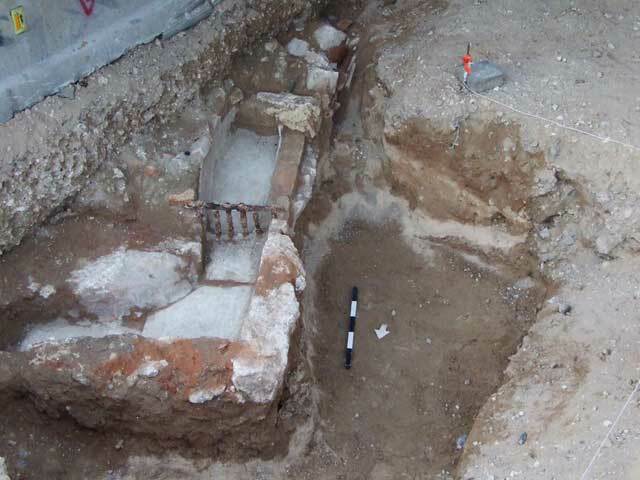 The occurrence of a burial alongside buildings and industrial remains is indicative of the changes that this part of the city underwent during the Byzantine period. It seems that the tombs represent an earlier phase, during which the Roman funerary tradition was continued there. The buildings and the kiln, however, were part of the industrial activity that developed in the later phases of the period, which are represented in the excavations in the flea market as well. Crusader Period. 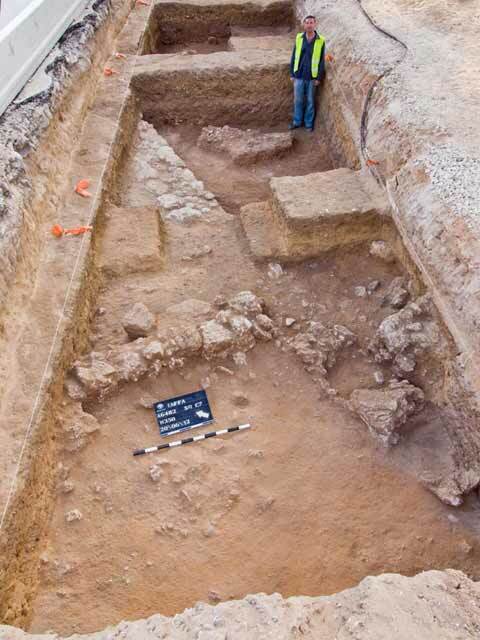 Two sections of a city wall ascribed to the renovated fortifications of Crusader Yafo by the French king Louis IX in the mid-thirteenth century CE were discovered on the western side of the street, along the eastern boundary of the flea market (Peilstöker et al. 2006; Arbel 2008). Another section of the fortification constructed by this king was exposed on Yehuda Ha-Yammit Street, near the port (Haddad 2011). The excavation in the flea market revealed some evidence suggesting a moat from this period; the modern street seems to follow its route. A vertical rock-cutting in the natural bedrock, which may be related to the moat, was identified in Sq B10. The sand fill found in it contained pottery sherds, some of which are from the Crusader period. 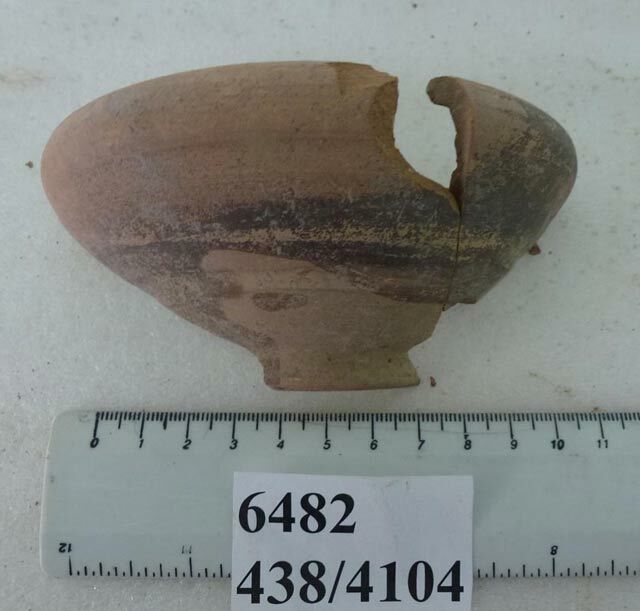 Evidence of a ceramic industry from the Crusader period was discovered in the northeastern part of Area A, where numerous sherds were found alongside production debris. Late Ottoman Period. Most of the finds from this period included remains of an irrigation system used to water the orchards of Yafo; these were uprooted during the rapid urbanization in the first half of the twentieth century. 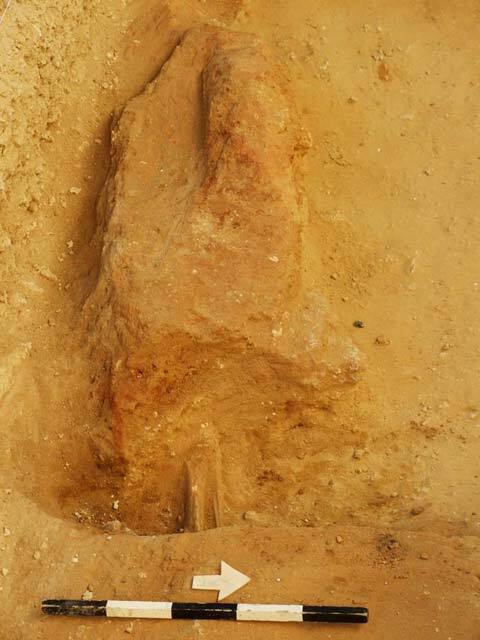 Similar finds were discovered in many excavations conducted between the mound and Jerusalem Boulevard. The rural character of this layer on Rabbi Yehuda Me-Raguza Street is reflected in the ceramic finds: mainly utilitarian, locally produced vessels, and very few European porcelain or porcelain-like vessels, which are prevalent at sites closer to the heart of the city, by the ancient mound. In some squares, the Ottoman sherds were found at a depth of over two meters, evidence of intentional fill that was meant to reduce the drop of the natural slope prior to paving the original road. A similar phenomenon was identified in other excavations in Yafo, such as at the Qishle and on Ha-Zorfim Street (Arbel 2009; Arbel 2010). In Sq B2 a water channel was exposed. Incorporated in it were two rectangular sections of hard limestone, along which was a drilled cylindrical pipe (Figs. 13, 14). 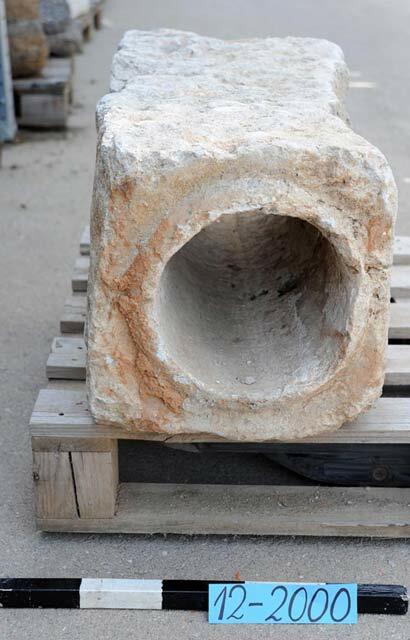 A similar section, probably part of an aqueduct that conveyed water from the Kabri springs to ‘Akko, which was built at the beginning of the nineteenth century, is on display at the Eretz Israel Museum in Tel Aviv; many additional sections were found in excavations in ‘Akko. The continuation of the water channel may be located on the western side of the street (Area Bw), where the corner of a channel, built of sandstone and plastered, had an iron grating in it to filter out debris (Fig. 15). Another irrigation channel (L637; Fig. 16) was discovered in the southwestern part of the street. Its source of water may have been a well near an Ottoman period building located at 38 Rabbi Yehuda Me-Raguza Street (outside the limits of the excavation). 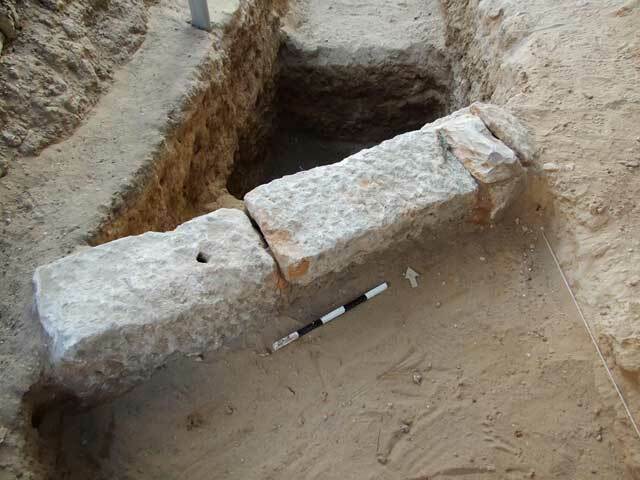 Yet, judging by its small size, it is more likely that the well was used by the residents of a dwelling, as was customary in Yafo at this time, and had no connection to the irrigation systems. North of the point where the channel turned eastwards was a coarse surface paved with building stones in secondary use, the purpose of which is unclear. South of the channel was an unusual wall (W709; length c. 19 m, height 2.15 m) that survived to a height of fifteen courses of kurkar stones, some of which were in secondary use, bonded with red mortar. The wall, which had only a northern face, probably supported a building or an enclosure. 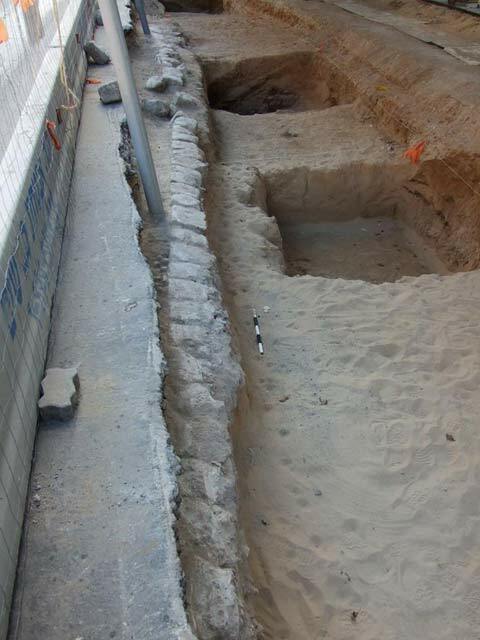 The remains of a wall (exposed length 21 m), which may have demarcated a cultivation plot, were exposed in Areas B and C. Sections of other walls from the Late Ottoman period were discovered near the intersection of Rabbi Yehuda Me-Raguza Street and Yefet Street. 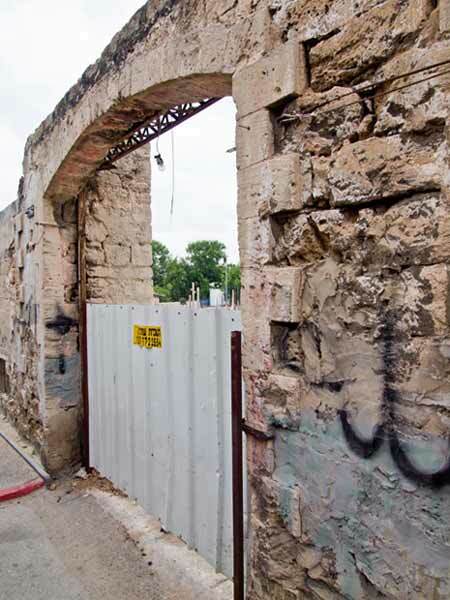 The enclosing northern wall of a compound that appears in aerial photographs from World War I still stands near Area D. The wall and the gate in its center were conserved and will be incorporated into a new building to be erected on the ground behind them. 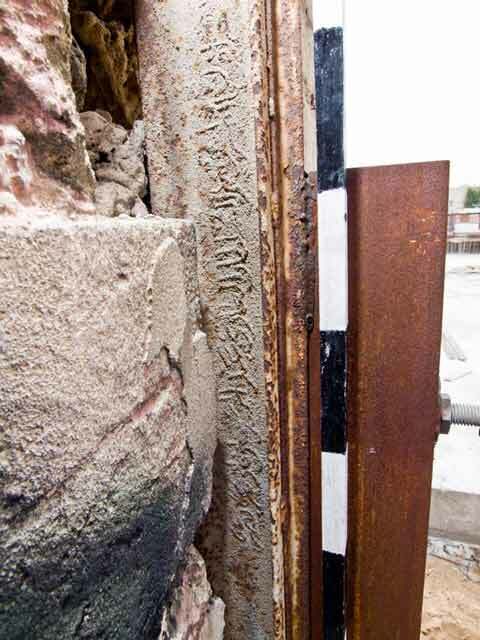 Two iron railroad tracks, which bore Arabic inscriptions mentioning the year 1907, were set in the doorjambs of the gate (Figs. 17, 18). The inscriptions bless the Turkish sultan in commemoration of the completion of a section of the Hejaz railway (see Levanoni 2006 for railroad tracks with similar inscriptions and dates on them). The railroad tracks were documented at the time of the excavation, but have since disappeared during the construction work that has taken place in the compound. British Mandate Period. The roadbed from the time of the British Mandate was exposed along the entire length of the modern street and included broken pieces of limestone placed on their narrow side (soling). The phenomenon is known from many streets of this period, such as in the Magen Avraham and Ben Gamliel compounds near Jerusalem Boulevard (Arbel and Rauchberger 2015; Rauchberger 2015). On a map from the 1930s, the street is called Zuqaq el-Butma (the alley of the terebinth tree), a name that alludes to a narrower artery lined with trees. 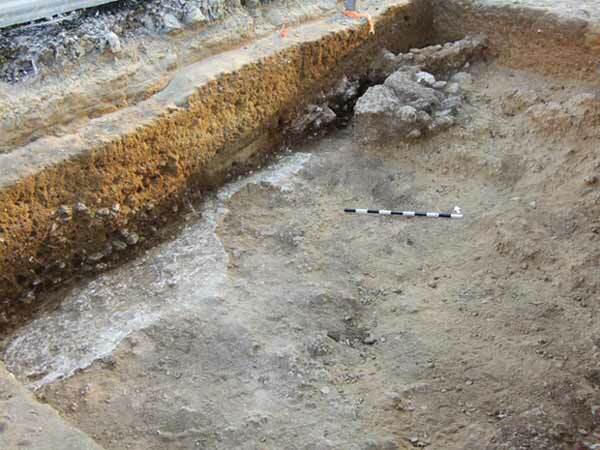 Additional evidence of early phases in the development of the street is a tamped layer of soil reinforced with gravel that was found in several squares and a row of curbstones (L200), a section of which (14.6 m) survived along the northwestern boundary of Area B (Fig. 19). Remains of paint were discerned on some of the stones, evidence that they were brought to the street in secondary use. They probably originated in ruins of Arab buildings from the Late Ottoman period or the beginning of the British Mandate period, when painting walls in such a manner was widely practiced. 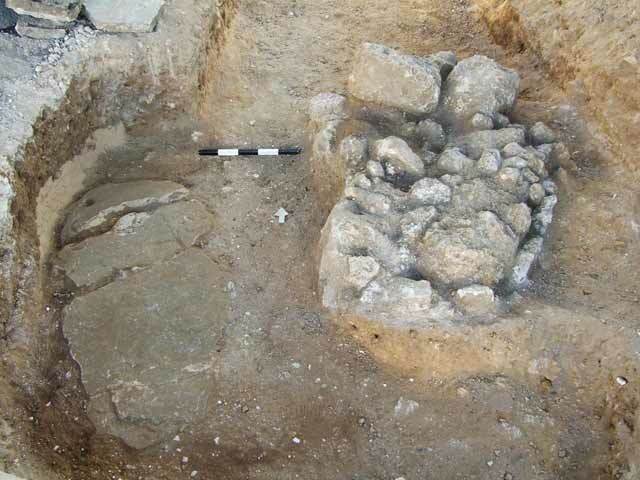 To date, the Middle Bronze Age burial is the only one of its kind to date in this part of Yafo; it is thus impossible to determine whether it represents a unique phenomenon or part of a burial complex that was not preserved or was not excavated. Despite the almost complete lack of Hellenistic architecture, the ceramic artifacts reflect activity or habitation near the road, an assumption consistent with the finds from the flea market. The tombs from the Roman period on the western part of the street belonged to the necropolis that developed around the city, which was later diminished and limited to the boundaries of the mound. This burial complex probably existed from the Hellenistic period until the Late Byzantine period, when construction spread east and reached the area of the street. It seems that the route of the street during the Crusader period extended along a moat that ran east of the thirteenth-century fortification line. In the nineteenth century, the area of the street was included in Yafo’s extensive agricultural system, which was obliterated due to the rapid construction that took place during the time of the British Mandate, when the street was first paved. Arbel Y. 2008. Yafo, the Flea Market Compound. HA-ESI 120. Arbel Y. 2009. Yafo, the Qishle. HA-ESI 121. Arbel Y. 2010. Yafo, Ha-Zorfim Street. HA-ESI 122. Arbel Y. and Rauchberger L. 2015. Yafo, Magen Avraham Compound. HA-ESI 127. Ayash E. and Bushnino A. 1999. Yafo (Jaffa). HA-ESI 109:97*. Barkan D. and Buchennino A. 2012. Yafo. HA-ESI 124. Ginzburg A. 2000. Yafo, 3022 Street. HA-ESI 111:42*. Haddad E. 2011. Yafo, Yehuda Ha-Yammit Street. HA-ESI 123. Haddad. E. 2013. Yafo, Yehuda Ha-Yammit Street. HA-ESI 125. Jakoel E. 2012. Yafo, Shim‘on Ben Shetah Street. HA-ESI 124. Levanoni Y. 2006. The Railroad Work for Honor and Glory. Et-Mol 185:7–9 (Hebrew). Peilstöker M. 2000. Yafo, Rabbi Yehuda Me-Raguza Street. ESI 20:49*. Peilstöker M. 2006. Yafo, Rabbi Yehuda Me-Raguza Street. HA-ESI 118. Peilstöker M. and Burke A.A. 2011. Preliminary Report for the 2007 Ganor Compound Excavations. In M. Peilstöcker and A.A. Burke eds. The History and Archaeology of Jaffa 1(The Jaffa Cultural Heritage Project 1; Monumenta Archaeologica 26). Los Angeles. Pp. 177–186. Rauchberger L. 2015. Yafo, the Postal Compound. HA-ESI 127. 2. 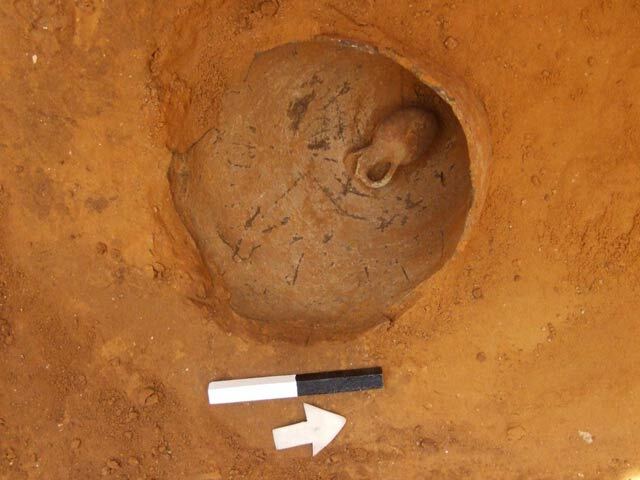 A fragment of a Middle Bronze Age II jar and the juglet that was found inside it, looking east. 3. A Hellenistic bowl found in debris cluster. 4. A section of a Hellenistic-period wall, the floor that abuts it and the bottom of a jar, looking east. 5. Area A, plan and sections. 6. A Hellenistic-period pit grave covered with a layer of tamped soil, looking west. 7. Burial cave(?) and the improvised blockage, looking north. 8. A Roman-period cist grave, looking southwest. 9. Candlestick-shaped bottles at the time of their discovery, looking south. 10. Remains of Byzantine-period walls, looking northeast. 11. A layer of industrial lime from the Byzantine period, looking northwest. 12. The two Byzantine-period tombs, looking north. 13. The Ottoman-period water channel, looking north. 14. Stone sections from the water conduit. 15. An Ottoman-period drainage channel with an iron grate, looking south. 16. A Late Ottoman-period irrigation channel, looking southwest. 17. The gate with inscribed railroad tracks, looking north. 18. A detail of the inscriptions on the railroad tracks, looking south. 19. A section of the curbstone of the street from the early twentieth century, looking north.